Mick McCarthy saluted his revived Republic of Ireland side as a 1-0 win against Georgia secured them top spot in Euro 2020 qualifying Group D.
Conor Hourihane's stunning first-half free-kick was enough to ensure McCarthy won his first two qualifiers in his second spell as Ireland manager, repeating a script he helped to write back in 1996 when he won his opening two games during his first spell in the job. 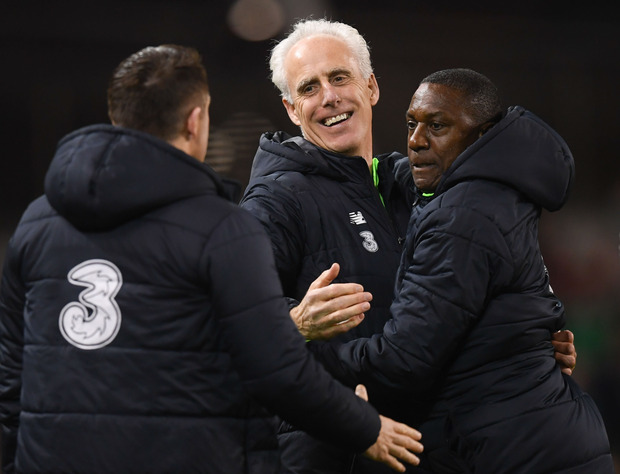 The positive atmosphere around the Ireland side contrasted the gloom of the final months of Martin O'Neill's tenure in the role, but McCarthy was keen to steer away from comparisons with his predecessor. "It's a little unfair to say its a change in attitude and emphasis because I've only been here a few days," stated McCarthy. "All I will say is the players have been brilliant from day one. They committed to everything I've asked of them and they are a great set of lads. "The nature of the game on Saturday in Gibraltar was we had everything to lose and nothing to win, but that 1-0 scrappy win gave us momentum and we played really well in this game. We could have put two to three past them and even though they had chances, we negated their style of play. Don't allow them to do what they want to do and we did that well. "We played some really good football and created opportunities that we didn't take, so one goal wins it." McCarthy played down the significance of Ireland moving to the top of their qualifying pool at this early stage of the competition, but he admitted the 3-3 draw between Group D favourites Switzerland and Denmark could help his side. "The top two could cut each others throats and allow us to pick up points," he added. "Switzerland were 3-0 up as well I believe. They are a very good side, but maybe took their foot off the pedal. I think we should just concentrate on our two wins. "We are just happy to get six points and we look to forward to Denmark away and Gibraltar at home now."